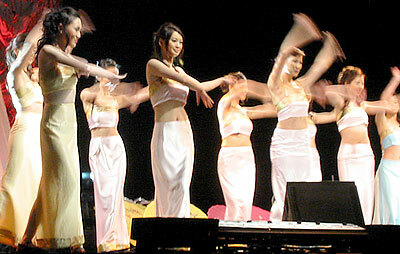 In a commanding performance, Sirena Wang won the 2006 Miss New York Chinese Beauty Pageant on Aug. 13 at the Mohegan Sun Casino in Uncasville, Conn.
Wang, a 20-year-old senior majoring in international business and music at Birmingham-Southern College, wins a $10,000 scholarship, a tiara worth more than $30,000 and the right to compete at the 2007 Miss Chinese International Pageant in Hong Kong. 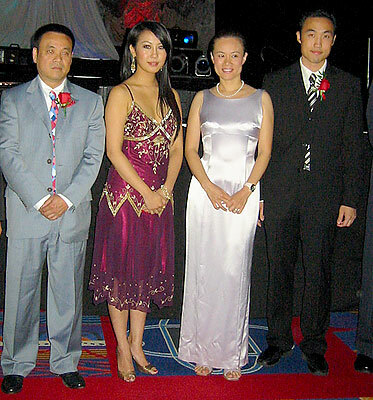 In addition to becoming the latest Miss New York Chinese winner, Wang bagged three out of the six special awards: Miss Talent, Miss Internet Popularity – which was determined by an online vote – and Miss Fitness. 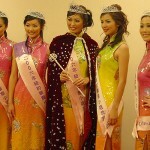 Adeline Chui won Miss Friendship, and Maggie Weng was the Miss Photogenic and Miss Farah winner. 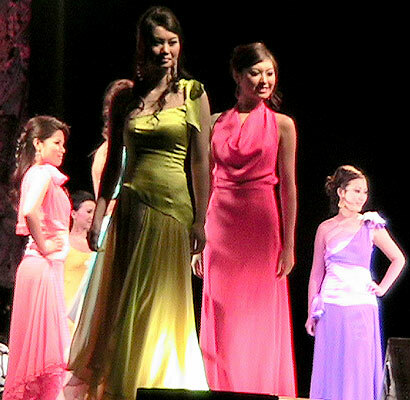 The rest of Wang’s court included Weng (1st runner-up), Ashley Zhu (2nd runner-up), Susan Liu (3rd runner-up) and Jane Teng (4th runner-up). 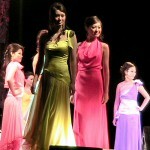 The panel of judges included Miss Hong Kong 2003 and Miss Chinese International 2004 1st runner-up Mandy Cho. 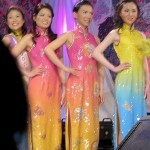 Despite the late timing of the event – the competition began past 1 a.m. and concluded a little more than two hours later – Wang deftly maneuvered through the evening’s segments, which included an opening dance number, the evening gown competition, the swimsuit and interview competition, a talent performance granted only to the top 5 talent finalists determined on July 28, a qi pao show, and a final question and improvisational skit. 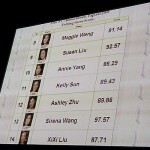 Wang recorded the top scores in the evening gown (97.57 out of a possible 100 points), swimsuit (97.00) and interview (96.86) segments, drawing astonished gasps from the audience who saw all 14 finalists’ scores displayed on large video screens in the ballroom. 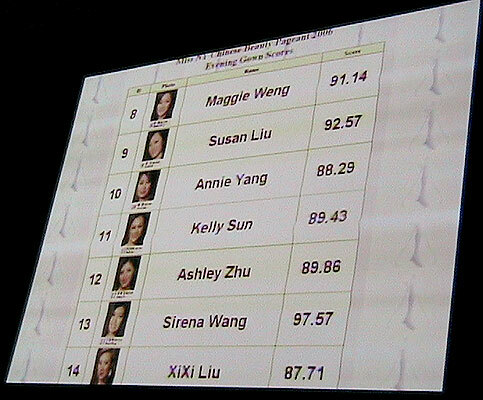 Her scores were several points ahead of her competitors in each category. 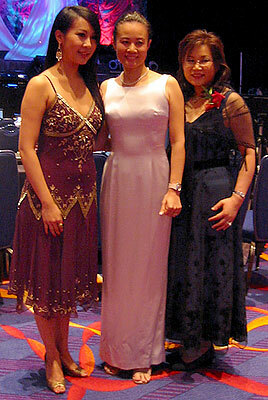 She also increased the difficulty of her piano and vocal performance of “Yesterday Once More” from the July 28 competition by preceding her song with an excerpt from the first movement of Edvard Grieg’s Piano Concerto, which she had performed with The (Birmingham) Red Mountain Chamber Orchestra earlier this year. 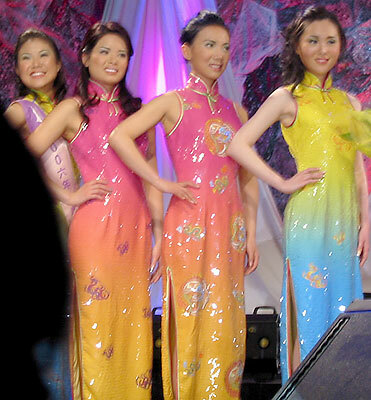 Although Wang will represent New York at Miss Chinese International in 2007, she was born in Jilin, China, and currently resides in Birmingham, Ala. Miss New York Chinese is open to contestants who have “resided in the United States,” and Wang took the opportunity of a summer vacation between school years to get back to her cultural roots. After the pageant, Wang’s enthusiasm was just as evident as it was during the preliminaries – even as the clock was ticking towards 5 a.m.
Assorted videos from the preliminary competitions, events and pageant night.